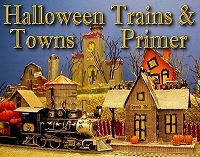 Update, August, 2013: Since we moved HalloweenTrains.com to our new server, we've had room to add lots of features, including many ideas for building your own vintage-style cardboard or faux-tinplate houses. 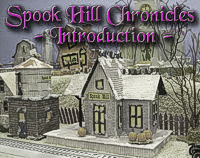 Also, we got so many requests to keep our novel Spook Hill Chronicles online that we kept it up. The bad news is that you may encounter some broken links here and there. Please contact us if you find a broken link or otherwise have trouble finding something. In the meantime, check out the links below to get an idea of what this site has to offer. This is just a sampling of products you'll find featured in other pages as you check out our site. Please contact us if you need more information or have any questions about anythign on our pages. Join the most famous citizen of Halloween Town - the Pumpkin King Jack Skellington - and the rest of its weird and wonderful denizens in Tim Burton's The Nightmare Before Christmas Black Light Village Collection - the first-ever village with black light effect from The Bradford Exchange, Hawthorne Village Division. Inspired by the critically-acclaimed movie milestone, your fantastical journey begins with Issue One, Jack Skellington's House, a FREE Jack figurine and the 12" black light fixture. Soon, your collection continues with Issue Two, Dr. Finklestein's Lab and FREE Dr. Finklestein and Sally figurines. Additional Halloween Town buildings, each a separate issue and some with FREE figurines and accessories, to follow.‡These spook-tacular Nightmare Before Christmas collectibles are handcrafted and masterfully hand-painted to capture all of the eerie excitement of Halloween Town. Discover even more ghoulish thrills when you flip on the included 12" black light fixtures and the buildings glow! Strong demand is anticipated, so don't delay. Order now! Fine collectibles, not intended for children under 14. Fire up a torch. Pack plenty of silver bullets. And, for good measure, bring along a sharp wooden stake. Under the eerie glow of the full moon, you'll be paying a pulse-quickening visit to the Universal Studios Monsters Halloween Village collection! The frights abound in this unique Halloween decoration, beginning with Issue One featuring Dr. Frankenstein's Castle and FREE Frankenstein figurine. Soon, the thrills and chills keep coming with Issue Two, Count Dracula's Castle, which includes a FREE Count Dracula figurine. Next, your decorative Halloween village collection continues with Issue Three, The Mummy's Tomb, and Issue Four, The Creature's Black Lagoon, each with select FREE accessories. Additional village buildings, each a separate issue and some with select free figurines and accessories, will follow.‡Now, you can pay a terrifying tribute to the classic monsters of the silver screen with this officially authorized Universal Studios collectible village collection. It's the perfect Halloween village decoration, handcrafted with the creatures and gothic castles that have been scaring young and old for over 70 years. Strong demand is expected for this screamingly scary exclusive. Order now! Enter Death Valley, a rowdy and rough village where skeleton bikers are sentenced to live out the rest of their death. 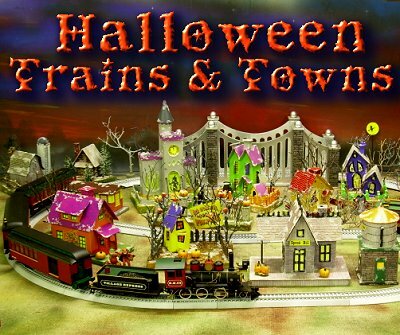 Now you can take a ride through their biker heaven with this creepy gothic village collection, exclusively from Hawthorne Village. This collection begins with Issue One, Last Chance Gas & Madman Marty's Garage with FREE Madman Marty figurine. Soon, your collection will continue with Issue Two, Haunted Manor with FREE Old Lady figurine and additional creepy village buildings, each a separate issue and some with select free skeleton figurines, will follow.Each collectible building in this Death Valley collection is handcrafted of fine artist's resin and exquisitely hand-painted. Plus, each freaky building eerily lights up from within, spotlighting the activities of the walking dead! Makes a unique addition to your collections and perfect for Halloween decorations. But strong demand is expected. Order now! Thomas Kinkade Artwork Beckons You to the Fishing Trip of Your Dreams - The Hawthorne Village people don't call this an "autumn train," but the reds, blacks, and golds look right at home with any autumn display village. This heirloom quality On30 scale collectible express train set! It's fully illuminated and richly finished in rustic hues, embellished with heartwarming fishing slogans and glowing Thomas Kinkade artwork of warmly lit cabins nestled in pristine wilderness settings! Available only from Hawthorne Village, this Thomas Kinkade collectible electric train set is crafted with extraordinary attention to detail. Plus, it comes with a nickel silver 16-piece track set and power pack, a $60 value, yours FREE! Go ahead, relax and watch the old-fashioned steam engine chug around the track, hauling your every care far, far away! Order now! Click on the link below to purchase or for more information. I just invented a new category, because some of these are so unusual, I'm not sure where to put them. Harry Potter's Hogwarts Express? - At long last, an model of the Hogwarts Express? that is big enough for small hands to operate. Fantasy lovers will enjoy a magical journey that is portrayed in J.K. Rowling's enchanting Harry Potter series. Train lovers will enjoy a truly historic event in the world of toy and model trains. This is the first European train ever modeled in O gauge by Lionel! It is also the only train on this page that runs on O gauge, 3-rail track, like the Lionel trains of old. Halloween Globe Operating Car - Okay, you won't want to run this car on any railroad with bridges or tunnels, but if you want to put down a circle of track, turn out the lights, and watch this moving pumpkin lamp circle the room, to the accompaniment of spooky sounds, you'll get plenty of fun out of this purchase. Electricity comes from the track through a double pickup. 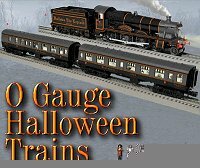 Custom-painted Halloween Locomotive - These are almost impossible to find - I'm probably wasting my time posting this link but a couple lucky folks may be able to get this if they move fast. It is the locomotive from the Hogwarts' express with a special custom Holloween paint job. Click on the following links to check availability. Click on the link at the right to check availability on Amazon. 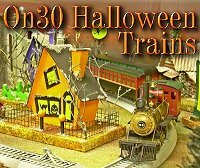 Lighted Halloween Car - This O-27 car will operate with just about any Lionel train set made since 1950. 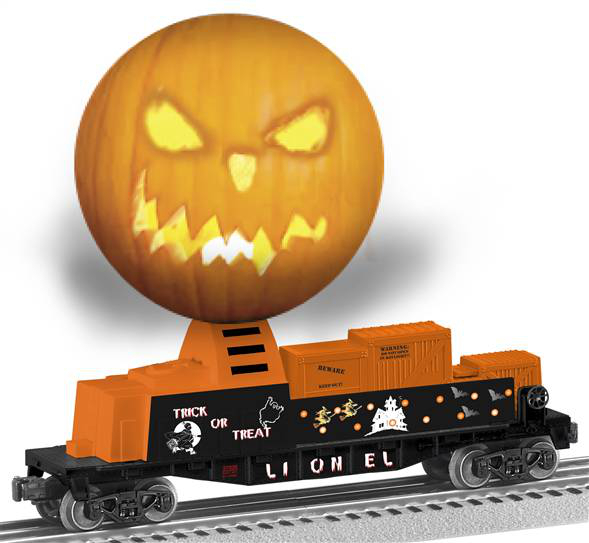 It is guaranteed to bring some fearsome fun to your Lionel railroad or Halloween Village - especially when you turn down the lights. Click on the following link to check availability on Amazon. 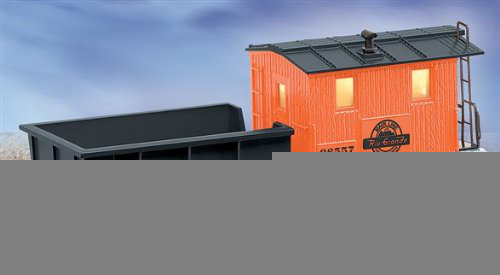 Custom-painted Fun - This O-27 car will add some October chills to your Lionel railroad or Halloween village. It will work with just about any Lionel train made in the last sixty years, including the Harry Potter set above. This has already sold out of Lionel's online store. Click on the following link to check availability on Amazon. Outfitted for serious Halloween work - This is a model of a Denver & Rio Grand work caboose, complete with crane and lighted cab, except that its paint job is designed for autumn cheer. Like the cars above, it will work with just about any Lionel train made in the last sixty years, including the Harry Potter set above. Click on the following link to check availability on Amazon. A Classic Redefined - Most folks who grew up with Lionel or American Flyer trains remember the "through" bridge, the one you could put anywhere on your railroad just by raising and lowering the track. Here's a version of that old favorite redecorated to give your railroad a little autumn cheer. Handsome Model Train Set Display Case Shows off Your Train Collection in Heirloom-quality Wood Cabinet with Glass Doors! - Provide an elegant home for your beloved model train collection in this heirloom-quality model train set display case, exclusively from Van Hygan & Smythe. Custom-designed in the tradition of fine European craftsmanship, its classic style is enhanced by solid hardwood construction with a rich walnut-finish. Hinged glass front doors reveal three 3-1/4" deep hardwood shelves, perfectly sized for your limited-edition train collections. Magnetic door closures minimize dust, and gleaming brass-finished hardware adds an elegant touch. Click on the link below to purchase or for more information.